With a vast railway network crisscrossing the length and breadth of India, safety on tracks is of paramount importance. Long welded rails are used extensively in railway tracks in India for increasing the speed of the rolling stock and better travel comfort. Fatigue fracture of rails is a possible occurrence in railway tracks because of the fluctuating stresses due to the varying traffic conditions and low fracture toughness of rail steels. Most rails are made from plain carbon steel to keep their cost low. 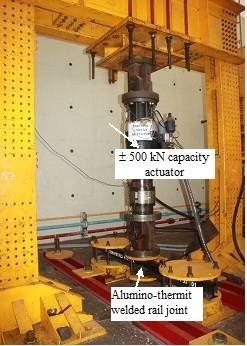 Due to heat affected zone adjacent to the weld, fatigue becomes critical in welded joints. Fatigue life evaluation of number of welded rail joints from government and private agencies are carried out at CSIR-Structural Engineering Research Centre (CSIR-SERC), Chennai, as per the specifications of the Research Designs & Standards Organisation (RDSO), Lucknow. The rail joints have to withstand two million cycles of constant amplitude sinusoidal cyclic loading. The test samples have an overall length of 2 m. They are supported over a span of 1.5 m and the load is applied at two points at a distance of 75 mm from the centre. Three samples have to be tested and all the three rail joints have to pass the specified number of cycles. Such modern fatigue strength tests by CSIR-SERC are helping Indian Railways to ensure safety of rail tracks. CSIR-SERC has been in the forefront in assisting Indian Railways for the past three decades, in assessing the quality of welded rail joints. CSIR-SERC has recently successfully completed fatigue strength evaluation of alumino thermit welded rail joints for Indian Railways. 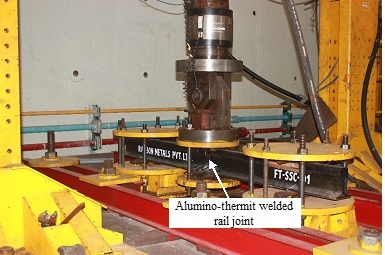 The alumino thermit process is extensively being used world over for joining the ends of the rails. Alumino thermit welding is a process that causes fusion of metals by heating them with superheated molten metal from an alumino thermit reaction between a metal oxide and aluminium. The significance of alumino thermit welding is that it is done at site.